“On July 22, 1939, the Dougherty brigade was complete with the arrival of Irene Margaret, making a total of eight children.” The family of Thomas A. and Rosella Finan Dougherty “always resided happily and as normally as possible with so many at 709 Lincoln Street, Cumberland, Maryland.” Thus begins the life history written by Irene during her candidature year. As “a prominent first grader” at St. Patrick’s School, Irene was “so proud to be included in the family march up the long church aisle in St. Patrick’s Church.” Irene received her first Holy Communion there in May, 1947 and was confirmed two years later. She calls her grammar school years, “ordinary but wonderful.” After graduating from the eighth grade in 1953, Irene began high school at Catholic Girls’ Central High, Cumberland, where she “continued schooling under the School Sisters of Notre Dame.” In Irene’s senior year, “another member of the clan set forth in her life’s work when Angela entered the School Sisters of Notre Dame.” Irene graduated from high school on June 2, 1957. “On Sept. 7 of that same year,” Irene said, “I made what seemed the longest march ever, as I neared the altar of St. Patrick’s. Receiving the candidates’ veil, I knew that, had Mom not led me to that aisle so often and had He not been there to guide me, I would never have had the courage to make that journey now.” During the candidature, Irene completed her freshman year at the College of Notre Dame of Maryland (now University). “More important,” she said, “I have learned the ways of Mary, at least a little.” Irene was received into the novitiate on July 26, 1958 and was given the name, Rose Mary. Sister Rose Mary professed her first vows on July 25, 1959. After profession, Sister Rose Mary returned to the College of Notre Dame of Maryland as a student. She then taught junior high classes at St. Mary’s, Govans, Baltimore (1960-68). She was a teacher of secondary classes at St. Mary Academy, Annapolis, Md. (1968-75). Rose Mary completed her Bachelor of Arts degree at Notre Dame College in 1965. As student at St. Louis University, St. Louis, Mo., she earned a Master of Arts in Spirituality in 1976. 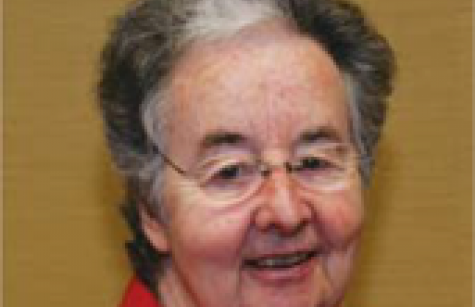 Sister Rose Mary became the director of the SSND Spiritual Center, Baltimore (1976-81) and spiritual director at Bon Secours Spiritual Center, Ellicott City, Md. (1981-83). She ministered in various positions, finally settling in as senior fellow for spiritual guidance at Shalem Institute for Spiritual Formation, Bethesda, Md. (1985-2004). During that time she was also the postulant director for the Baltimore Province (2001-03). Rose Mary was also Associate Professor of Spiritual Theology and the Dunning Distinguished Lecturer at the Ecumenical Institute, Baltimore (1994-2011). She volunteered at Joseph’s House, a hospice for formerly homeless men who have AIDS, and offered retreats and group spiritual direction for hospice caregivers. She participated in the Trust and Dare Ministry as spiritual director for the Archdiocese of Washington, D.C. (2005-17) and in retirement created the Companioning the Dying program. As a sensei (teacher) in the school of Eastern meditation, Rose Mary also taught Zen and assisted people in integrating contemplative presence and just action in their lives. Among the books that Rosemary authored are: Group Spiritual Direction: Community for Discernment: Practical Guidance for Offering and Participating in Spiritual Direction in a Group Setting (1995), To Live in Christ: Growing in Spirituality (2007) and Discernment: A Path to Spiritual Awakening: The Essentials of Cultivating a Discerning Heart (2009). Sister Rose Mary also wrote articles for Shalem newsletters and SSND publications. Rose Mary was foremost a religious woman, a School Sister of Notre Dame, who became a teacher, writer, counselor and spiritual director. She was a sister, a colleague and a friend. Her qualities of honesty and openness endeared her to others. Smart and knowledgeable, Rose Mary was a woman of wisdom and gentle humility. She had a hunger for God and a deep sense of the spiritual. Her desire for openness in prayer enabled her to be an excellent model of prayer. She said, “Any time I am willing to be available to love another I am mediating love for our world.” In companioning the dying, she brought deep peace and a comforting presence. Rose Mary’s teaching style was simple and direct. Evaluations were always glowing, and students reported, “I consider it a real honor to be in her class.” She was gifted writer and was able to communicate in an incredible way. Rose Mary’s spirit of exploration led her to discover as much as she could about her illness. She endeavored to maintain a quality of life, but her body could not contain her yearning spirit. Until her final day she used every possibility to be her best self. Sister Rose Mary died peacefully at Maria Health Care Center on February 28, 2019. A Memorial Mass was concelebrated on Mon., March 18 in the chapel of Villa Assumpta. Rev. Joseph Muth, pastor of St. Matthew Church and Blessed Sacrament Church, Baltimore was the celebrant. Rev. Joseph Simmons, pastor of the Church of the Holy Spirit, Joppa, Md. was co-celebrant. Cremains will be interred in Villa Maria Cemetery, Glen Arm Rd., Glen Arm, Md. at a future date. Sister Rose Mary is survived by her sisters: Mary Ellen Dougherty, SSND, and Catherine Rutledge, nieces and nephews, grandnieces and grandnephews.